Creating marine reserves can reverse the despoliation of the sea that fishing has caused, forming sanctuaries in which fish are safe from hook, trap and trawl. Where reserves have been established and are well protected, fish populations quickly rebound, sometimes becoming five or ten times as abundant as in fished areas. Fish in reserves grow larger, and the most vulnerable and spectacular species are able to make a comeback. 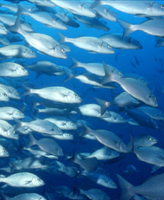 Better still, reserves can supply fish to nearby fishing grounds, boosting catches.